I've been wanting to do a "G" thanks card for a while now and finally got the opportunity. I love sketch challenges and that is exactly what this was a sketch challenge over at Splitcoaststampers.com. 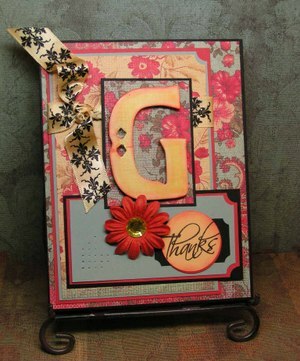 It's basically pretty easy - just lots of layers - a chipboard letter and a thanks stamp! This is a 5-1/2 X 4-1/4 card with a left side fold. Oh, I just LOVE this!!! Again,another GREAT Card! I feel so blessed to have you as a mentor in my life. Your talent speaks to my love of arts and crafts. I would love to stay at home and craft the day way. What a great way to use the chipboard letters that we just have to have these days!!! Can one have too many sets of letters?